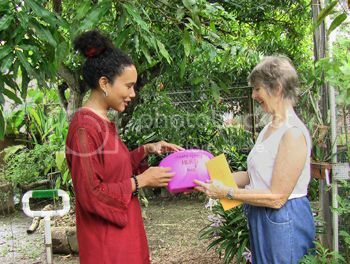 Founder of W.O.R.C., the Wildlife Orphanage & Rehabilitation Centre (Trinidad & Tobago) . 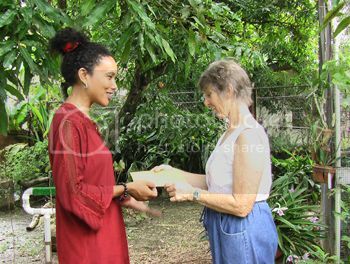 Admired and rewarded for her selfless dedication to the cause of caring for and rehabilitating wildlife in Trinidad & Tobago. Happy Hippy Productions is proud to present Detta with a donation towards W.O.R.C. and a commemorative item to honour the occasion. Elspeth Duncan, Happy Hippy Productions, presents Detta Buch with a H.H.P. cheque for W.O.R.C. Click on that link to read more about the origins of the trophy and the $10 concept. 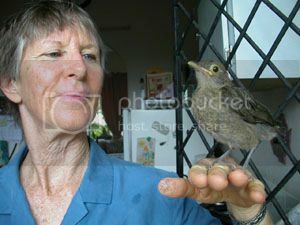 The name Detta Buch has become virtually synonymous with the cause of rehabilitating wildlife in Trinidad & Tobago. If you have ever found an injured wild animal, you have more than likely been referred to "Detta". Her name is a salve for the wild and wounded. 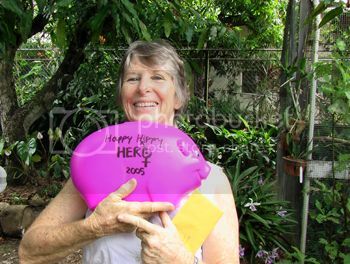 Rather than write about the recipient of the first annual Happy Hippy Hero Award, I decided to ask her a few questions so that she could represent herself and her thoughts in her own words. Click here to read the full interview with Detta. A must-read for anyone interested in wildlife rehabilitation and/or willing to assist W.O.R.C. (financially or otherwise), with their much needed work. E: What is your greatest joy in this work? Detta: Being able to release a healthy animal into its own environment, after an illness or injury is a profoundly satisfying and humbling experience. It makes one appreciate the grander picture and raises ones spirits above the disappointments and let-downs. The other unique feature of the work is becoming intimate with each patient and discovering the rich emotional landscape of its personality and species. I have learned more from the cases I’ve treated than I could articulate in common language. It is translated in the way I approach other cases and has influenced the way I engage people. Detta poses with the piggy bank trophy, which she says will accompany her to conferences at home and abroad, where it will sit on a table and gather funds for W.O.R.C. Click here to visit the W.O.R.C. website which, although still a work in progress, is quite informative. Account # 901 101 100 5 at any branch of RBTT, Trinidad & Tobago, W.I. Donations go towards food bills, medical and repair equipment and infrastructure. 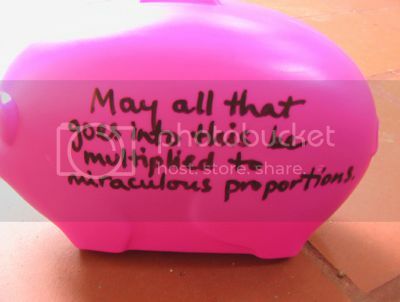 Image shows prayer written on right side of piggy bank trophy. Interested in helping/volunteering in some way... or want more information? Drop Detta a note or letter or call her at (868) 637-3842. In closing ... congratulations, Detta! May you be blessed with continued health, strength, guidance and assistance in following your calling. Wisely chosen and richly deserved. Congratulations to both the winner and the doner--to the winner for her selfless dedication and wonderful work; to the donor for having the insight to recognise this work. May blessings rain on you both. A wonderful choice. Detta deserves much praise for her selfless devotion to the creatures so many ignore. I sincerely hope that she will get the response she deserves with many donations.